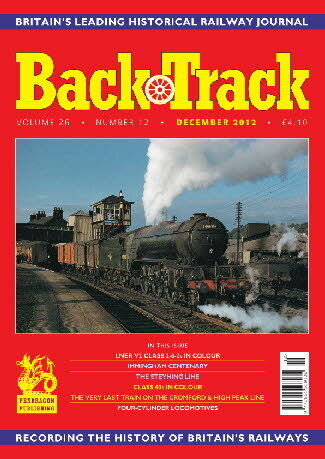 BackTrack December 2012 journal from Pendragon Publishing. 'Austerity' Package - colour spread of the ex- War Dept. 2-8-0s and 2-10-0s. How Long and How Far? - Philip Atkins considers some aspects of locomotive life expectancy. The Tweed Valley's Vanished Railway - A. J. Mullay reports on the Talla Railway, in southern Scotland, a century after its demolition. Immingham 100 - Part One - Mike G. Fell and R.A.S. Hennessey trace the history of the port and its technology, including the Grimsby & Immingham electric tramway. Railways in the Fells - four pages of archive photos of the Settle-Carlisle line from the Pendragon archive. Forty Days - four colour pages by Michael Mensing of the English Electric Type 4/Class 40s during their early years. The Long Day - Brian Topping remembers a cold and tedious day on the footplate working from Bury shed. V2 Excellence - four colour pages of the LNER V2 2-6-2s at work. Suffixes, Prefixes, Ampersands and Brackets - Michael J. Smith examines the Metropolitan Railway's compound station names. The Steyning Line - Jeremy Clarke presents the story of the Sussex branch from Christ's Hospital to Shoreham. The Very Last Steam Train on the Cromford & High Peak line - recalled by Phil Waterfield. The 'Micheline' Diesel Railcars - J. Crosse describes an early experiment from the 1930s. Just Add More Cylinders - Part One - Miles Macnair looks at the evolution of the British four-cylinder simple expansion locomotive. The Varsity Line's Missing Links - Jeffery Grayer reviews recent developments in the possible revival of the Oxford - Cambridge route.